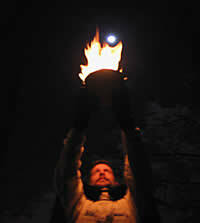 MoonFire has met on the 3rd Sunday of each month at 1:30 in the UU Church of Arlington for the past 20 years. We welcome all newcomers, and we have many ways to get in touch with us (see "contacts" and "Yahoo Groups"). This site is old, and is not updated regularly. That does not mean we are not meeting, only that the webmaster has gotten busy and things are a bit dated. Feel free to look around at who we are and what we do, nothing has changed, but most of what you will see is from several years back. For latest news check out our twitter feed (above) or see us on Facebook! We are a CUUPs (Covenant of Unitarian Universalist Pagans) Chapter. We meet at the UUCA Church, 4444 Arlington Boulevard (corner of Route 50 and George Mason Drive). 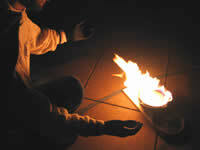 We celebrate Ritual the third Sunday of every month. 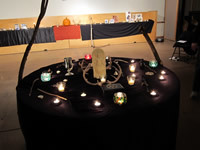 Ritual begins at 1:30 PM and is followed by potluck and fellowship. Attendees are encouraged to arrive by 1:15 PM and to check the easel at the inside stairs to determine in which room we will be meeting. "We strive to build a safe and nurturing community that is inclusive and provides for spiritual growth and service to the Earth and Her children. We are the Hub of the Wheel of Life, the Crossroads where all meet; We are a Chalice of the Goddess; We are of the Earth, rich and empowering; We are a Rock, safe and secure; We are a Rainbow, diverse with many colors yet together in one band; We are a Flame of Spirituality, providing the light to see our path before us."